Savory pumpkin masa dough is filled with spicy pork chorizo. 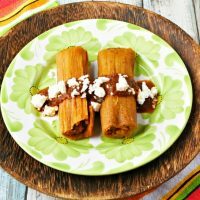 Pumpkin Chorizo Tamales with Pumpkin Mole is a flavor-plosion in your mouth! If that’s not enough, they’re topped with rich pumpkin mole and creamy queso blanco. This post is sponsored in conjunction with PumpkinWeek. I received product samples from sponsor companies to aid in the creation of the PumpkinWeek recipes. All opinions are mine alone. I have no idea why #PumpkinWeek made me think of tamales. I guess I’ve been craving tamales. Like really GOOD tamales. Not those fluffy ones that are more water than masa and stuffed with what I equate to be chicken pot pie filling. No. Not that. I think I had a zucchini in my chicken tamale once. Not what one would expect in a tamale. For me, a tamale is light but also slightly dense in texture. It’s not super soft and doesn’t fall apart when you cut it with your fork. It holds it shape. You could pick it up without it falling apart. I mean, that’s what they were intended originally; portable food. Did you know that these little gems go back as far as 100AD? I’m serious! There’s pictorial references of this delicious take-out food in Guatemala. They were used as portable food to take on hunting trips and to travel long distances. However, with the ones I’ve been getting today at restaurants, there’s no way they could do that. Yes, I have high standards for my tamales! It goes WAY back to a trip we took to San Antonio. Actually, it was San Antonio and then it was Corpus Christi. Well, since we’re THAT close to Mexico, we hopped across the border at Matamoras and had THE BEST tamales and margaritas ever. Ever since then I’ve held all other tamales to that standard. Fast forward MANY years. My mother, and I can’t remember why, told me about Tuscan Tamale Company. She might chime in with a comment as to how she came across these delightful tamales, but she did. And she called me one day and wanted to know if she could send us some for Christmas. Of, I’m ALL about the tamales. The hubs, not so much. That’s fine. More for me!! She sent me a range of tamales based on what she thought I would like and asked if I would like. I think she sent me the chile relleno, green chile and cheese, I want to say there was a chicken pot pie one and I think the chocolate cheery ones. They held up to my standards. Even the sweet ones! They were tender and firm at the same time. I devoured them all! And had no regrets. And I just might do the same thing with these. In fact, I brought one for a snack between my wicked early breakfast and the late lunch I’m forced to take while on training. It’s a perfect little bite of delicious to tide me over until my Caesar salad for lunch. This is the first time I’ve made tamales on my own. We used to make them sometimes growing up. Dad loved to make them. Heck, he just loved to eat them. He would get the canned ones and be happy. I was tempted one day to do that, but I resisted the urge. I just bought the masa needed to make them in the hopes that one day I would be inspired to make them at home. And, well, I was when #PumpkinWeek was announced! Yeah, not sure how I got to tamales from pumpkin. But, it’s a natural combination. The oldest seeds they found for a pumpkin type squash was around 7K to 5500BC in Mexico. They’ve been using squash in food for centuries! Don’t you just love the history lesson I’m giving you with this post? I think we should all know a little more about the food we make and eat. But then again, I’m always interested in historical and traditional recipes all over the globe. This is not one of those traditional recipes. It uses chorizo which is historically a Spanish sausage made with minced pork and paprika. That’s where it gets its red color from. Then how does it get to Mexico, you ask? Well, legend has it that Hernan Cortes brought pigs from Spain to Mexico and started making sausages with them; chorizo. Whether that’s true or not, Spaniards did bring pork and chorizo to Mexico when they sailed across the Atlantic to South America. So, I guess technically it COULD be a traditional recipe. Either way, it’s a delicious recipe. The rich pumpkin flavor throughout the masa dough adds a slightly sweet flavor while the chorizo makes for a hearty and spicy filling for the tamales. It’s a subtly sweet and boldly spicy combination that packs a flavor punch you’re going to love! I mean, just look at that color! You know it’s going to have ah-mazing flavor. And I haven’t even started talking about the mole sauce, yet. Oh yeah, this is a double whammy of a recipe. There’s pumpkin in the tamales and pumpkin in the mole. You should make both and surprise your Thanksgiving guests with an interesting and delicious appetizer. Have recipes cards handy. I’m sure they’re going to want to know all about this appetizer you’ve served up they can’t seem to get enough of before the main course. However, this could mean you’ll have LOTS of turkey left over because everyone will fill up on the tamales. Just warning ya! You’re welcome! The mole sauce is rich and creamy with a kick of spice. It would be perfect on grilled meats. I’m thinking of using some of the left over in a chili later on for game day eats. I’ve put mole sauce in chili before. It adds a richness that I love. Now, before this is the longest post ever, I’m going to remind you to enter the giveaway and make sure to check out what the rest of the bloggers are serving up today. Good luck on your entries! I hope you win! Combine the masa harina with the next five ingredients (salt through sage). Add the olive oil and pumpkin. Using your hands, mix until well combined. When the pumpkin and oil have been completely incorporated, add the chicken stock 1/2 cup at a time until the batter holds its shape but is also easy to spread. Set aside. Cook the chorizo in a skillet over medium-high heat. Once cooked, pulse in a food process until coarsely chopped. Using an offset spatula, knife, or your hands, spread a 1/4" this layer of masa mixture onto 2/3 of the larger side of the corn husk making sure to leave at least 1 inch of room on one side to allow the tamales to seal properly. Place about 1 to 2 tablespoons of chorizo down the center of each tamale and roll making sure the edges of the dough meet. If the husk happens to tear, simply place another one behind it to keep the tamale from escaping. After you toll the tamale, fold the end under and place, fold side down, in a large pot fitted with a steamer basket. Make sure that are snug but not stuffed into the pot as the dough will expand during cooking. Continue rolling and folding the tamales until all the masa and chorizo is used. Place about a cup of water in the bottom of the pot and steam for an hour; making sure to check the water level mid way through cooking and add more as needed. While the tamales are steaming, make the mole sauce. Quarter the onion and place on a broiler pan along with the hatch and guajillo chiles. Broil the chiles 1 minute. Remove from the chiles and return the onions to the broiler to continue cooking until they begin to char around the edges. Remove them from the broiler and set aside. Remove the seeds, membrane and stem from the toasted chiles. Add to the blender along with the remaining ingredients. Blend until pureed. Strain the mixture using a fine mesh sieve into a saucepan. Simmer until thickened and reduce by about one quarter. Serve the tamales topped with the pumpkin mole and garnished with queso blanco. I’ve had tamales on my to make list for ages, this is such a fun twist! They were fun to make and taste so good.